So let's talk about something I don't think I've ever discussed in a review before: band names. A good name helps a band stand out, can occasionally set the tone of the music you're about to experience, can evoke a certain atmosphere and personality. For instance, one of my all time favourite band names is for the anarchist punk band Chumbawamba - it evokes curiosity, it definitely stands out, and it's got a sort of gleeful irreverence that really characterizes the wit and character of the group. But really, the big story tied to this act is band name controversies, when a certain act calls themselves something - let's say Viet Cong in this case - and discovers that if they want to play the liberal college circuit across the United States, such a name might drive a backlash. Not going to lie, this controversy irritates the hell out of me, and not just because I could point to a slew of bands in punk, post-punk, and metal who have names with far more dark and disturbing connotations - look up what Joy Division means some time, I dare you. And while I could go on how saying 'Viet Cong is offensive' propagates a simplistic and US-centric view of the far more complicated Vietnam War, where there was considerable moral ambiguity on both sides, or how even if it was inappropriate and offensive it completely fit the dark, pummeling tone of the band's music... but it's not like the group made any of those arguments. Instead, the Canadian group shot themselves in the foot repeatedly during interviews by pleading ignorance and all sorts of nonsense, and since they obviously weren't about to do anything more interesting with the name and concept and wanted to continue making money, they eventually just gave in and changed their name to Preoccupations. Not a bad choice - not as punchy as 'Viet Cong', but it did fit the sort of detached bleak melancholy that ran through their compositions, so I won't hold it that much against them. In any case, this allowed them to get away with a second self-titled album with the new name - with a part of me kind of thinks is cheating a bit - but whatever, how is Preoccupations? 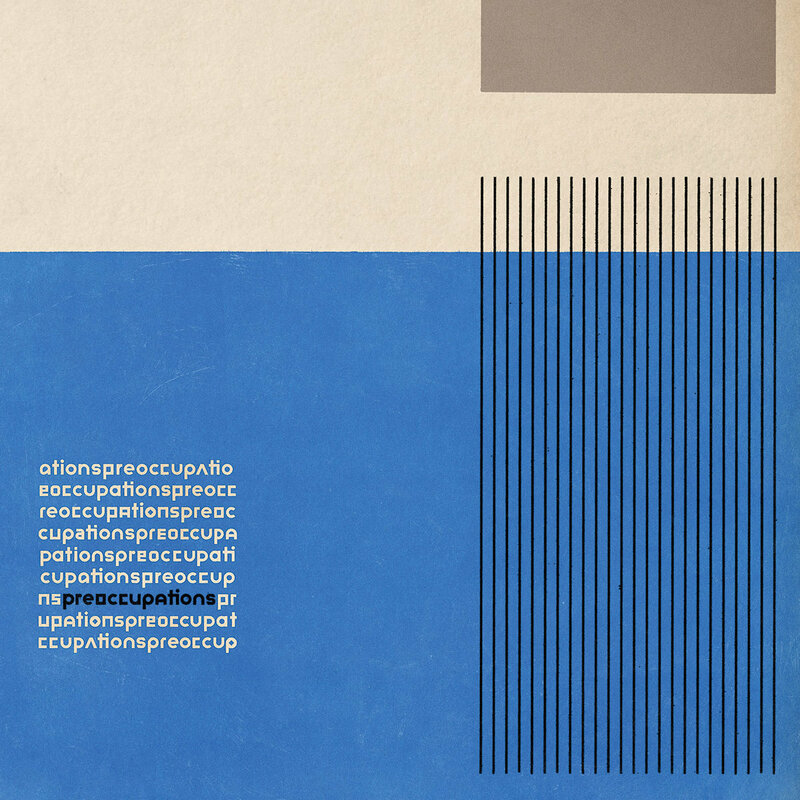 Honestly, if I were to find a record that completely lives up to both the idea and nature of its title, it'd be the self-titled record from Preoccupations. And while there are some hold overs in the general sound from Viet Cong, Preoccupations is decidedly its own animal: not as dark and resignedly nihilistic, but still methodical in its precisely constructed degeneration. You can say it's a step towards more melodic or even hook-driven songs... but on the other hand the elements of drone that always remained behind the seething post-punk have taken more prominence, which contributes to a record that flows in awkward spurts and feels midway between The Cure and Tim Hecker. So it's an odd listen, but does that make it good? Honestly, tough to say, especially as I don't find this record as impactful as Viet Cong from last year or the early Women releases before that band. And the place where we need to start is the production and instrumentation, because like between Women and Viet Cong, there is very much a break in sound between this record and the last, with enough traits to be recognizable as a similar act, but the textures used are considerably different. For one, it's nowhere near as heavy and noisy - the guitars are no longer swollen with crushing feedback, the vocal pickup is cleaner, and the bass... well, actually the grooves either fall into stiff rigidity with the lockstep percussion or build to some pretty impressive grooves, it depends on the track. Where this album distinguishes itself more is in the guitar production and blend with the synths - with the much brighter tones on this album, the early-80s influence on the shimmering guitarwork is palpable, calling to mind a lot of Echo & The Bunnymen or even The Cure on songs like 'Stimulation', albeit with lower grooves that grind a little harder and push away from an easy hook. That's not saying there aren't solid melodies here: the ghostly waves of guitar on 'Monotony' that transitions into the three-note echo that drives 'Zodiac' with a great bassline and even hints of industrial percussion; the whistling gleaming tones that expand off the gurgling gallop of the bass and drums on 'Degraded'; and that huge punchy melody that comes through on the guitars on the back of 'Stimulation'. And then there's the behemoth track 'Memory', which clocks over eleven minutes, begins in a haze of dreamy guitar lines circled by the percussion groove, before breaking into an oddly earnest midsection with a more wiry bass, and even that will break into a drone that'll stretch for the remainder of the song, well over four minutes. And really, the transitions and drone come together remarkably well in cultivating the atmosphere, a fair bit better than the drone that opens 'Anxiety', but it also highlights the real differences in sound that can make this a jarring listen. It's not helped by the inclusion of 'Sense' and 'Forbidden', two tracks barely over a minute that contribute instrumental ideas but feel painfully undercooked, especially 'Sense' with its atonal warbling. And yet for as dour as this record can occasionally feel, it's not a monochromatic experience or a depressing one, or even one lacking in momentum. Most of that is courtesy of the stark and well-defined percussion backing more melodies, but the other part is frontman Matt Flegel, whose vocal tone has always been a bit difficult to describe. On this record, though, he balances languid, clinical control with deeper, Michael Gira-esque tension that gives you the impression he's holding back a much darker force that could cut loose at at any time. One thing to note is that he's not as sarcastic as he was with Viet Cong - still detached, but you can tell there's investment, and in the duet with Dan Boeckner on 'Memory', whose tones are much lighter and more earnest, their interplay adds a fascinating dynamic. But to explain that, we need to get to the lyrics and themes, and remember when I said the title of this record encapsulates the idea and nature of this record? Well, it comes through most here, especially in the language used. Flegel's writing has always felt clinical in its approach, almost academic in its statements, but it seems like fragments of humanity leave him a bit flummoxed and uncertain - he can approach anxiety with the sort of borderline detachment you'd expect in an office, but it's very clear things are slipping out of control. Hell, for as much 'as 'Degraded' could be a dead ringer for describing a breakup as 'conscious uncoupling', it's clear that some emotion is slipping through. Both 'Monotony' and 'Zodiac' are pictures where faced with static realities of boredom or where everything is determined, there is unease and shifting beneath it. And 'Stimulation' makes that sense of no control all the more blatant, showing how to mislead and paralyze with an overload of information - to quote the song, 'comatose in unfamiliar ways'. And that's one of the reasons why 'Memory' is such a powerful and heartbreaking track, as we watch Dan Boeckner's character seemingly lose his mind and memory, with Flegel playing the impassive observer whose comments fall midway between a strange blend of analysis, gaslighting, and a buried sense of empathy. But throughout this record that unease that something isn't quite right persists, and by the time we get to 'Fever', it seems like whatever analyzing force that was trying to keep things in line is giving up, admitting you're not really afraid and instead to just 'carry your fever far away from here'. It brings to light an unspoken truth that has been lurking through the entire record: more often than not, you choose your preoccupations, set your own traps... and if you want to walk away, more often than not you can - the system can't really stop you if you disengage. Now believe it or not, this isn't an entirely unique or new theme: hell, fellow Canadian post-punk act Ought explored something similar to slightly better effect on Sun Coming Down last year. But Preoccupations do a damn solid job with it too, and this is a pretty solid record, one that does grow on you the more you think about it. Again, I don't think it's as punchy or as potent as the work they did under Women or Viet Cong, but it shows a side of the band that do appreciate, even if it can feel misshapen or distorted. For me, it's a light 7/10 and a recommendation, especially if you're a post-punk fan - otherwise... it's not an easy listen, but it is a thought-provoking one, I'll promise you that.